It’s been a while since our last newsletter and the big news around the farm is the arrival of our new baby girl, Tanager, born on March 31 - a blue moon. She is big, healthy and wonderful and mom is really looking forward to getting back out into the grove with a bigger crew in tow. All in a day's (or five) work. Prunings in the aisle ready for chipping. Luckily, after a very dry winter, March and April have brought some welcome rain so we don’t have to turn on the irrigation quite yet. January and February were busy with pruning and now the trees are in bud, soon to flush with blossoms. 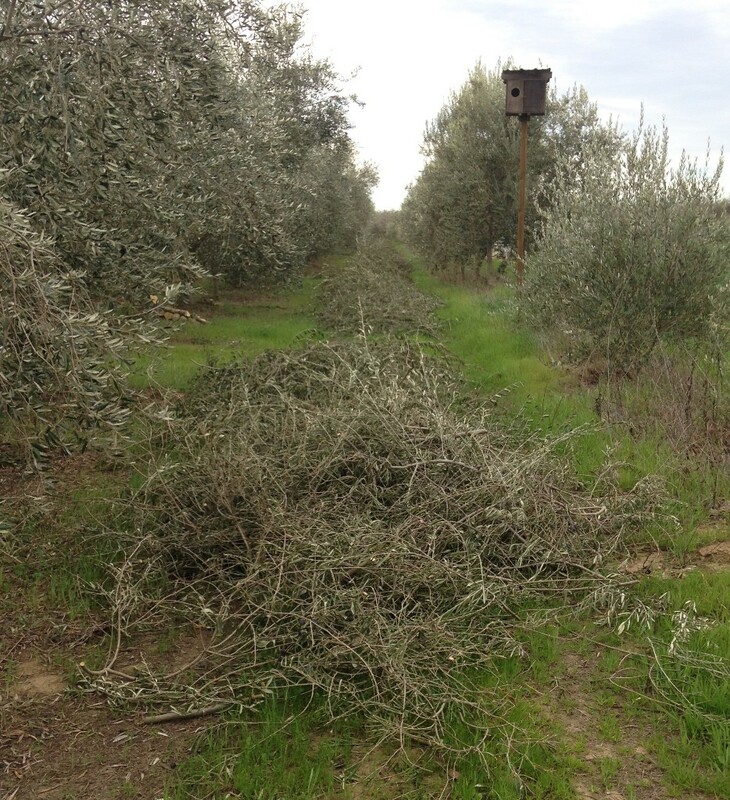 Olive trees are wind pollinated so no bees required, though our grove is home to many wonderful pollinating critters nevertheless. 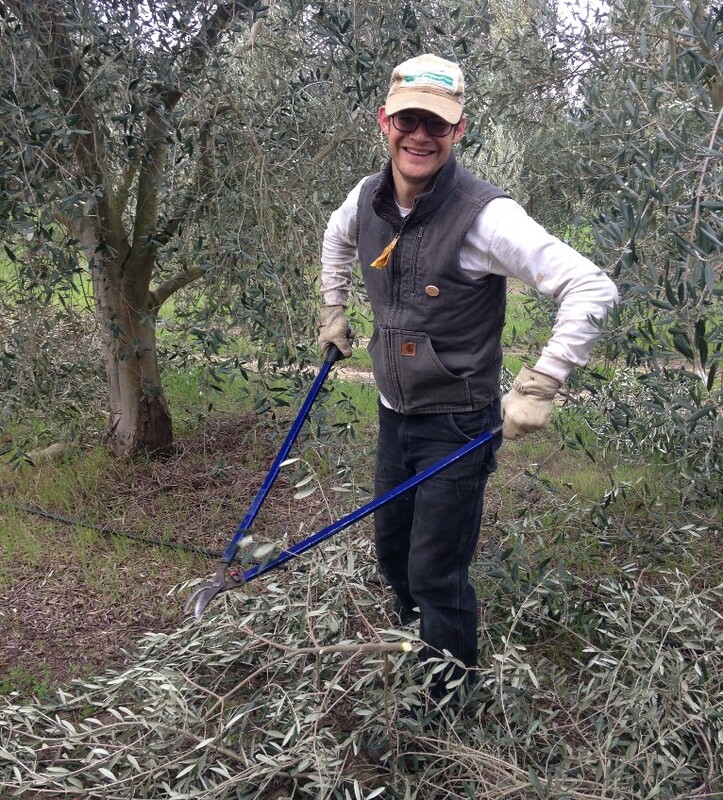 Colin pruning the Frantoio's on a chilly March morning. Olives are alternate bearing trees, meaning a year with lots of fruit is typically followed by a year with less fruit. Because last year was a heavy fruit year, we are expecting this year to be a bit more moderate, still with plenty to go around. By popular demand, Flatlands is now happy to offer Single Oil Club subscriptions by mail. Oil will be shipped USPS Priority as follows: two packages of 4 bottles each distributed in fall (early December) and spring (late April or early May). Cost will be $166: $17 per 500ml bottle x 8 plus $30 shipping/handling. Email us directly at flatlandsoliveoil@gmail.com to inquire and include shipping address. Depending on interest, we may offer Family and Oil Lover shares in the future. For those of you in and around the Bay Area or the Pacific NW, you can join the Club anytime of year. We distribute in the following locations: Davis, Livermore, Oakland (North Oakland and East Oakland), San Francisco, Portland, Seattle, and the Kitsap Peninsula. We are also happy to ship orders of 4 or more to non-subscribers - email flatlandsoliveoil@gmail.com with your address to place an order. The price is $18/500ml bottle plus $15 shipping and handling. Mother’s day is right around the corner and what better way to send your love than the gift of olive oil (for fathers too). Single Varietal Frantoio: As always, this is a fruit forward oil from a quintessential Italian variety. Quite green with prominent artichoke notes and some dry grass, we find this to be a moderately bitter and pungent oil, that we practically drink right out of the bottle. Mission Yuzu: 2016 left us with a dearth of Yuzu, but this year, the trees were positively laden. For the uninitiated, Yuzu is an Asian citrus with unique and delicate aromatics (think more tangerine/grapefruit) is new “it thing” of the culinary world. This oil has a distinctively citrus and slightly resinous flavor. It is a deep oil that pairs stunningly with fresh peas or limas drizzled over pasta with a crumble of ricotta. Perhaps it’s spring or perhaps it’s the proliferation of Easter and Valentine’s day candy, but we have been thinking a lot about chocolate lately. So, we wanted to share an excellent recipe for pairing olive oil with chocolate. For the purists among you, here’s a beautiful, simple chocolate cake and for the more adventurous, an adaptation of a Yotam Ottolenghi recipe for halva and tahini brownies. Substitute exactly the same amount of oil for butter - in this case 9 oz - to really make the halva and tahini flavors pop! We reduced the cook time by a couple minutes in our "test kitchen". Avocado aioli is also a favorite with the Yuzu oil. Mash avocado, salt, pepper and a generous dose of oil, then spread on fresh bread.